I'll start by saying I am not usually a huge fan of muffins (don't start me on store bought ones, whenever I have tried one, I ended up with a dry bready horrible muffin). But I came across this recipe and although I am usually hesitant to make muffins, it looked so easy to make I had to try it. I followed the recipe the first time I made them and although moist and tasty the grated apple got lost in the muffin. So this time I finely diced the apple and it was much better. By dicing the apple you get a slight bite of the apple, which is delicious. The size of the muffin depends on how you like it, if you want them larger, make them larger, just adjust the baking time. Not sure that smaller will work, but try if you like. Anyway these are soft, moist and tasty. They are not too sweet, which is always good in my opinion. A great afternoon tea snack or a lunchbox filler, these super quick to make muffins are worth trying. Preheat oven to 180C. Line six 1/3-cup muffin tin with paper liners. Place the self raising flour, caster sugar and cinnamon in a large mixing bowl. Add the apple, oil, egg and milk. Mix until just combined. Crumble topping: Place the plain flour, sugar and butter in a small food processor and blitz until it resembles breadcrumbs. (If you don't have a food processor, place in a medium sized bowl and use your fingertips to rub in the butter, until it resembles breadcrumbs). Add oats and stir through with a spoon. 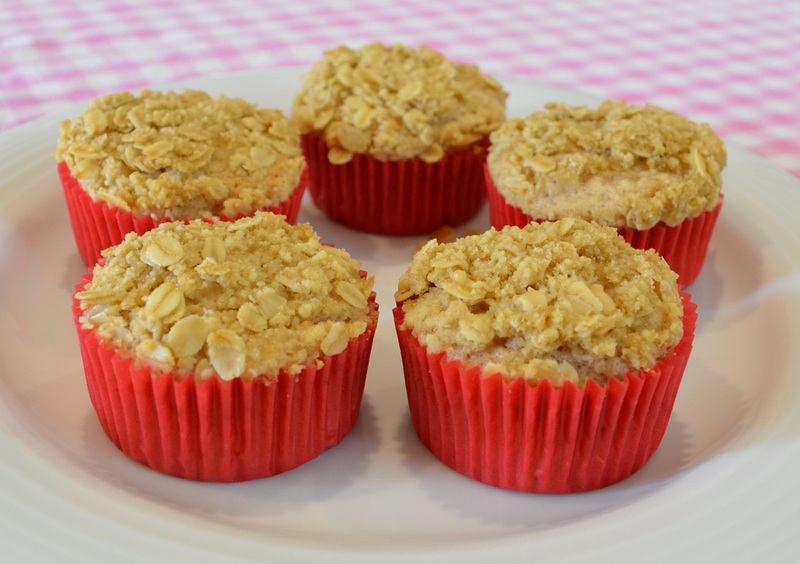 Place the apple mixture into your prepared muffin tin until 3/4 full. Add two-three heaped teaspoons of the crumble mixture over the apple mixture to cover completely. Bake for 20-22 minutes or until cooked through. Leave in the tins for 5 minutes before placing on a wire rack to cool. Repeat with the remaining apple and crumble mixture until all is baked.